The Contoured Comfort 4' Log Porch Swing is crafted from Northern White Cedar, which is naturally resistant to insects and decay. Contoured Comfort seats and side stabilizing logs ensure that your rustic porch swing will stay at the perfect tilt for maximum comfort and safety. The absence of chains at the base of the log swing keeps it from flipping backwards when in use. Leaving your log swing unfinished will let it age to a beautiful silver gray, or you can finish it with your choice of stain or sealant. This swing will fit right in on the porch of any rustic lodge, log cabin, country cottage, even a lovely suburban porch! Your rustic log porch swing is a wonderful place to spend an evening visiting with family and friends. Check out these Contoured Comfort log lounge chairs, loveseats, swings, rocking chairs and visa-tete or tete-a-tetes for the perfect porch or yard seating arrangement. Crafted from Northern White Cedar. Contoured Comfort seat slats & side stabilizing logs. Chain not included but we recommend chain rated to 600-700 lbs. 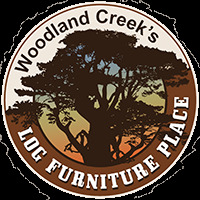 All availability lead times are estimated and are subject to fluctuation due to a number of variables that come with hand-building rustic furniture from the ground up once it is ordered.